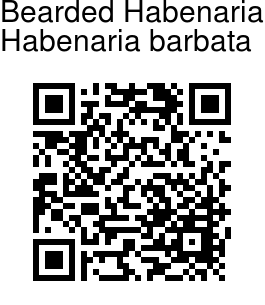 Bearded Habenaria is a terrestrial orchid, 15-35 cm tall. Flowers are greenish-purple, about 2 cm across. Sepals unequal, ovate, green; dorsal sepal 0.8-1.2 x 0.3-0.6 cm, tapering, green, hairless; lateral sepals sickle shaped, 0.8-1.2 x 0.3-0.6 cm, tapering, green, hairless. Petals are entire at base, bipartite above the middle, broader, velvet-hairy, upper lobe longer, curved upwards, 0.5-0.8 cm. Lip 1.3-1.5 x 0.5-0.6 cm, longer than sepals, rough hairy, linear at base, 3-furcate, greenish purple, side lobes shorter than mid lobe; spur as long as the ovary, 1.5 cm. Flowers are borne at branch-ends, in many-flowered lax raceme, up to 20 cm long. Bracts are ovate, 1.5-2 x 0.5-0.8 cm, leaf-like, sheathing, tapering, longer than ovary. Tubers are hypogeal, ovoid or oblong, 2-3.3 cm diameter. Stem is with a purple hue, erect. Leaves are 5-6, scattered in the lower 1/3 rd of the stem, ovate or narrow-lanceshaped, 2-6.5 x 1.2-2 cm, pointed or tapering, margin entire, white, slightly wavy and sheathing at the base. 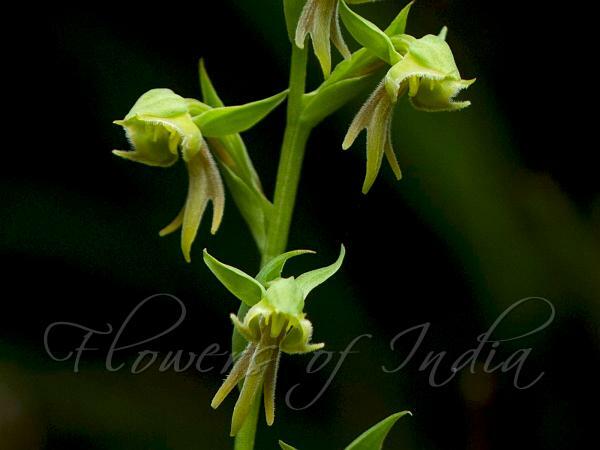 Bearded Habenaria is found in Central, Peninsular India and Sri Lanka. Flowering: October-December. Identification credit: Sushant More Photographed in Satpuda Hills, Madhya Pradesh.